For anyone visiting Crufts for the first time they may wonder how the very important person presiding in the centre of the show ring received the honour of judging his or her breed at this very prestigious show. Although Crufts is ‘just another championship dog show’ not all championship judges can expect to be invited to participate at this event. All judges must have served a special apprenticeship before judging at Championship level. Starting at the most basic of appointments, a person keen to judge will first take part in ‘going over’ dogs and getting to know their breeds at ringcraft and match nights held in their own clubs. They will start at the lowest sector of their breed clubs judging list which is the ‘C’ list. When a club is happy that the person meets the clubs requirements they will move on to the ‘B’ list where with luck and patience they will be invited to judge at Open Shows around the country. During this time they will have to attend training sessions and take relevant examinations to prove they are worthy to judge. Eventually when the time is right and all training has been completed a person may be invited to judge at Championship level. The Kennel Club is very strict as to who is given this honour and expects the applicant to meet all requirements of a show judge. Following a secret ballot by the Breed Council the future judge is either passed or turned down for the appointment. Yes, many people are turned down by their Breed Council and the Kennel Club. 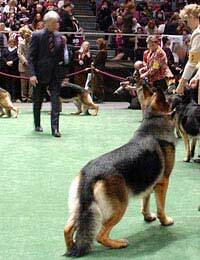 Not all Officers and Committee members of breed clubs can vote for prospective championship judges. The Committee must have a high percentage of people already actively judging at Championship level. It sometimes happens that the committee does not have sufficient judges on its committee at which point they have to invite enough judges onto the sub committee in order to comply with the Kennel clubs regulations. These co-opted judges are usually members of the breed club and live in the area the breed club covers. Once a person is judging at Championship level they must show that they are worthy of the honour. Along the way some judges are never asked to judge a championship show after their first appointment. This may be that they did not perform their duties seriously or that a complaint was made against them. A judge has to know many rules about ring procedures let alone knowing their breed and how to pick the best dogs on the day. Sadly many judges still place their friends’ dogs above more worthy winners. They will also only place handlers whom they recognise as owning dogs that are related to their own kennel – this is known as being ‘facey.’ There are others that place exhibitors that are able to do them favours. Perhaps another exhibitor is judging later that year or perhaps they have the ability to influence a club to pick judges for a future show. It is well known in show circles for appointments to be swapped and favours offered in this way. The Kennel Club frowns upon anything like this as do most canine committees, however it still goes on. If you are aware that a judge is not completely honest, never give them an entry. You may not be brave enough to lodge a complaint about the judge but better to save your money than to encourage this corruption to continue. If an exhibitor is unhappy about a judge or fellow exhibitor they are allowed to lodge an official complaint. The complaint must be given to the show secretary before the end of the show. This will then be passed to the Kennel Club with the end of show reports. Unfortunately, a complaint will not be processed unless a deposit of £35.00 is paid to the Kennel Club. It is not unknown for a group of people to club together if there is general unhappiness. A judge can expect to receive an invitation to judge at Crufts once they have given tickets (CC’s) in the UK for many years. In some breeds this can be as little as twelve times, in others it can be much longer. This can be the culmination of a long and successful association with their breed. On the other hand it can be the result of a lot of backslapping and membership of ‘clubs.’ Sadly there are many people who are more than deserving to judge their breed at Crufts but because they are not forthcoming in promoting themselves and do not know the ‘right’ people they will remain in the shadows. Luckily the genuine breed followers are loyal to these people and you will always see a good entry at any show where they judge. Judging is very much a career for some people who will climb the ladder to the top of the dog world. Many people are good and honest supporters of their breed - and some are not, so remember you have the choice vote with your feet and save your money!